Following an overwhelming ‘yes’ vote in June’s strike ballot, UNISON members on the Camden parking enforcement contract with NSL are set to mount an initial two-day strike on Wednesday 11 and Thursday 12 July. 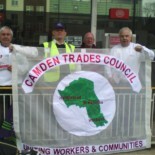 The action marks a dramatic escalation of the UNISON branch’s long-running campaign to win a dramatic improvement in pay for workers who currently earn just £8.09 an hour (after probation) despite generating crucial revenue for Camden Council and braving the elements as well as abuse from some of the motoring public almost every working day. The 97.7% vote in favour of a strike on a 63% turnout highlighted the level of anger and frustration at chronically low pay and frequent examples of management bullying. Since the announcement of the ballot result on Wednesday of last week (27 June) more than a dozen other workers on the Camden contract have joined UNISON, bringing membership to more than 150 – or some 80% of the total workforce. At the Camden UNISON branch committee meeting on Tuesday (03 July) one of the NSL shop stewards paid tribute to the branch as a whole, saying that “We [on the NSL contract] are now a ship ready to sail”. The steward added that the local dispute had a much broader significance and the action that workers on the Camden contract were now prepared to take had national significance, with the potential to inspire low-paid workers elsewhere in Britain to stand up for themselves. The NSL workforce has come a long way in a short space of time, with UNISON membership nearly trebling over the course of less than three years. Last year the Camden branch became the first in UNISON to win recognition for collective bargaining from NSL, which reluctantly conceded on the basis of the high proportion of the workforce in membership. To date NSL management has not shown itself willing to enter into serious negotiations around UNISON’s pay claim and at the moment is dropping no hints that it really wants to avert a strike. UNISON members on the NSL contract both need and richly deserve the support of their fellow branch members and UNISON members across the country. The branch committee strongly urges members to visit a picket line on either Wednesday or Thursday morning from 6.30 AM onwards at any of the half dozen NSL bases across the borough. Needless to say, UNISON very much hopes that a two-day strike will result in very significant concessions by the NSL and a settlement to the dispute, but there is no doubt that members are prepared to take further action, if necessary, in the immediate run-up to and even during the Olympics in order to secure long overdue justice on pay. For further information about what you can do to help our fellow trade unionists on the NSL contract please contact the branch office by phone or email. Donations to the strike fund can be made by cheque to “Unison Camden NSL“, c/o Camden Unison, 59 Phoenix Road, London NW1 1ES.